It's summer. 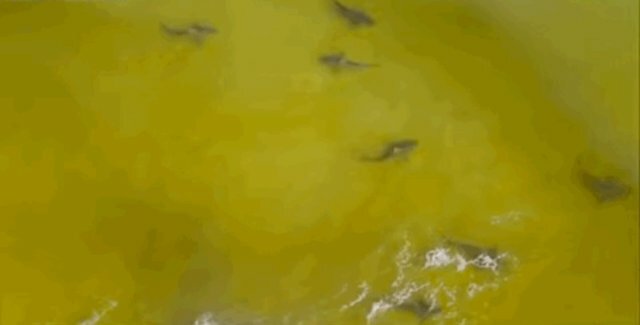 Sharks are out in full force, gathering by the hundreds to feed along the Gulf Coast in one of the most impressive spectacles nature has to offer. Even pilot Steve Olive, who frequents the area for fishing, says that he's never seen so many sharks together in one place. "I fish in and out of here and sure we'll see shark periodically but I don't ever remember seeing anything like that," Olive says. "You know you can tell people about this they won't believe it." Late last week, a sighting of only about two dozen sharks in the same area prompted the closure of a nearby beach, just to be safe. But Pensacola Beach public safety supervisor Bob West says that concerns about shark attacks are largely unwarranted. "There's sharks in the water all the time," West tells the News Journal. "There's only been five shark (related) fatalities since 1988 in Florida. There's a lot more to worry about than sharks, like rip currents, lightning and drunk drivers." The number of fatalities each year from shark attacks is so low, in fact, that it's dwarfed by other, unlikely-seeming causes of death, such as from chairs. Here are 18 other things way more likely to kill you than a shark.